How has video conferencing changed the professional landscape for companies and employees? Read on to find insights collected from the Small Business site and The Future of Business Collaboration and Pownowwow blogs. Company: this is one of the best results if not outright the best one, on the list. With low cost web based video technologies like Blue Jeans, small companies and startups now have the chance to add video to their organizations without hurting their bottom line. 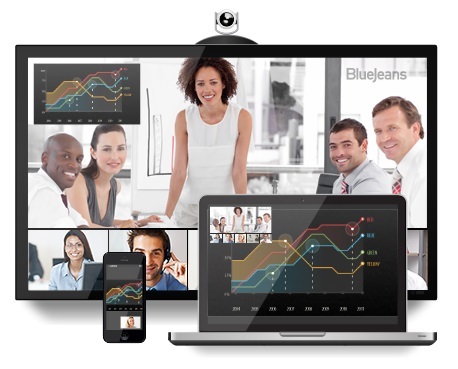 And with stellar audio and clear HD quality, video conferencing with Blue Jeans Network services make for the ideal professional environment, whether you have team or client meetings scheduled. Employee: If you work remote or offsite, you save up on regular commuting fare and meals. You won’t even have to spend on taxi rides for those mornings when you’re already late for work and you want to get there as fast as you can. Video conferencing has saved you the expense. Company: With video meetings, you get to see your team, even when they’re offsite or working from home. This is also extraordinarily important for managing remote teams on a global scale. Virtual meetings via web based video calling technologies make it possible for you to hold those regular Monday meetings for both onsite and offsite staff. Easily check up on whatever work progress was made last week and what your team members have, in terms of workload, for the coming week. With video meetings, everyone can come to the meeting, whether they’re offsite, working from home or even in transit via their laptop, mobile phone or tablet. Employee: Got another memo? With video conferencing, you won’t ever have to be late for a meeting, again. Whether you’re in the cab, stranded at home due to the four feet of snow outside your garage or working out of the local café, you’re still present for the meeting. If you’re sick, you won’t have to even move from the couch. All you need is to connect to that video conference and participate for, at most, an hour. After that, you can knock back, take those meds and sleep the rest of the day away. Company: Traveling, and even making travel arrangements, takes time away from the work itself. With less travel required from employees, they now have all the time in the world to devote every minute of that eight hour shift to their work and nothing else. That’s a win for companies. Also, with video chats, companies have greater control over, and access to, their remote teams. This helps ensure that productivity and performance goals are always met. Employee: For offsite or remote workers, there’s the fact that, unless there’s a meeting scheduled, you basically have more time in the day to devote to your work. That’s because you don’t just save up on the travel time. You also save up on the time it takes for you to get ready for work. For some, that takes an additional two hours. For some, it takes minutes. You also enjoy greater flexibility in your work. Unless there’s a strict deadline, or rush request, you usually have all the hours of that day—eight hours, to be precise—to put together whatever deliverable or output you need by end of shift. So if you’re an early riser and you get your best work done in the mornings, by the time the clock strikes noon, you could be well on your way to dotting the last T’s on that project. The rest of the day is now yours. Company: When you hold meetings, failing to invite someone or two can make some members of the team to feel left out. That’s not going to inspire stupendous levels of teamwork and camaraderie in your team. With video conferences though, even when they’re out or working from home, they can easily join in and participate. That’s one way to make sure no one feels left out and keep things on a positive keel at work. Employee: Working remote? For remote and offsite employees, meetings are especially important. Often, it’s the only time they have to get to know and spend time with other members of the team. Working offsite or from home can often make employees feel neglected, underappreciated and, worse, even ignored. Those feelings can translate to poor work quality, performance that’s less than stellar and slipups in attendance. With group video chats and calls though, you won’t have any reason to feel neglected or ignored in any way. Some companies even keep a company chat or thread open for 24/7. And anyone on the team, on both sides of the Atlantic, can say a quick hi or a simple hello. Video calling technologies help make you and everyone else feel you’re a key part of the team. All these, and more, show the world of difference that technologies like video conferencing have made possible. Given the huge advantage it offers, it probably won’t be long now until web-based video calling services become a basic part of most companies and their communication platforms.